By Jeffrey M. Perkel, DXS tech editor. Drug development used to be accomplished by the chemical equivalent of what you might call the spaghetti method: Throw a bunch of molecules against the wall and see what sticks. More recently, pharmaceutical companies have applied a more rational approach, using the molecular structures of drug targets to design molecules that “fit” them like a lock to a key. The technique most often used to solve those molecular structures is x-ray crystallography. With this approach, which turned 100 years old in November, a high-powered beam of x-rays is shot at a crystal of protein molecules. The x-rays collide with the crystal’s atoms, scattering at specific angles. 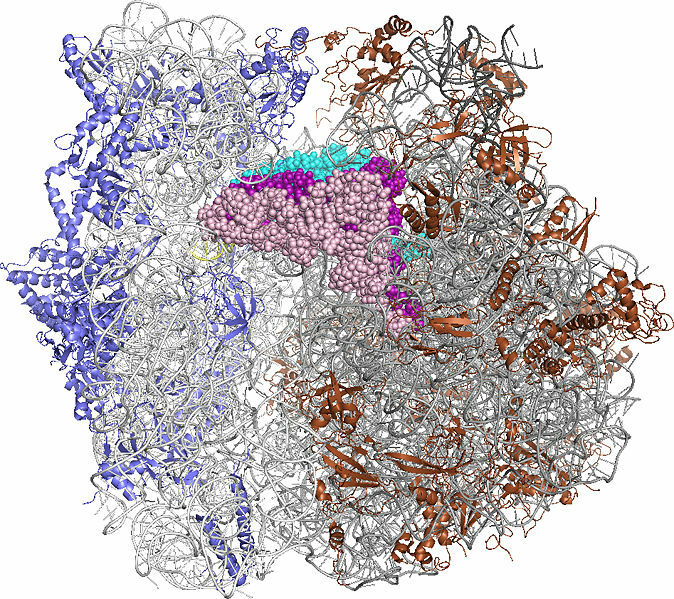 Working backwards from that information, researchers can figure out the original structure. … a method of determining the shape and structure of things that we can't see with our own eyes. Imagine that you have captured Wonder Woman's invisible airplane. You can't see it. But you know it's there because when you throw a rubber ball at the space, the ball bounces back to you. If you could throw enough rubber balls, from all different sides, and measure their trajectory and speed as they bounced back, you could probably get a pretty good idea of the shape of the plane. Anyhoo, as the name of the technique implies, the key to crystallography is, well, crystals. But not all proteins crystallize, and even with those that do, it can be hard to grow crystals large enough for the technique to work. Recently, though, a pair of technology developments have made it possible (in some cases) to work around these problems. The first development was the commissioning in the past few years of ultra-bright x-ray sources in California (the Linac Coherent Light Source at Stanford) and Japan. These so-called “x-ray free electron lasers” (X-FELs) shoot incredibly bright, incredibly short x-ray pulses, pulses that are so intense that they destroy a sample in a fraction of a second, but not before the x-rays (which travel at the speed of light, natch) have bounced off of it. The reason crystals are required in crystallography is that any one diffraction event is hard to see. The regularly spaced molecules inside a crystal amplify that relatively weak signal, simplifying detection and structure determination. As it turns out, the brighter an x-ray source, the smaller the crystal required to obtain such data has to be, and with X-FELs, the crystals can be very small indeed – on the order of millionths of a meter (micrometers) in size, and perhaps even smaller. Which brings me to the second development. In the March issue of the journal Nature Methods, a team of researchers led by Michael Duszenko in Germany showed that some proteins that cannot crystallize in a test tube will crystallize inside insect cells. 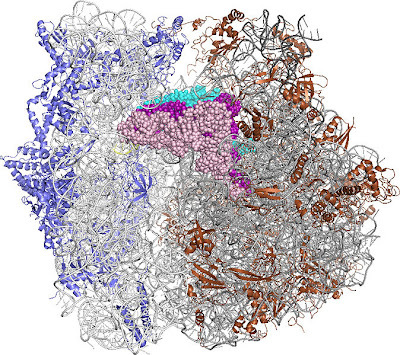 Protein chemists often use cells as molecular factories to obtain large quantities of protein. But the goal is to extract the protein from the cells, not have them crystalize inside of them. Generally speaking, protein crystallization inside cells is a bad thing, the kind of thing researchers really don’t want to see; Duszenko and his team are the first to capitalize on this so-called “in vivo crystallization” phenomenon. The crystals Duszenko's team collected are quite small, of course –- they fit inside cells, after all -- and in that initial study, they were on the order of 1 micrometer wide and 15 micrometers long. But as it turns out, they are big enough for the X-FEL. In the March paper, the team showed that these crystals will diffract x-rays in the X-FEL, but they didn’t solve the resulting structure. Now, in a paper published Nov. 29 in Science, they have. They did it by combining X-FEL and in vivo crystallization to solve the structure of a trypsanosomal enzyme called cathepsin-B, a potential drug target for African sleeping sickness. 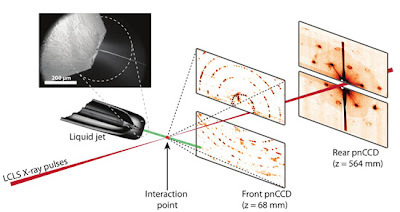 The team sprayed a stream of tiny enzyme crystals (each about 1 x 1 x 11 micrometers) into the path of the X-FEL, which fired discrete pulses of x-ray, each just 40 femtoseconds, or 0.000000000000040 seconds long, 120 times per second. Every so often, one of those pulses would collide with a crystal, and a nearby camera would capture the event. This method is called “serial femtosecond crystallography,” in that it collects a series of diffraction “snapshots,” thousands of which must then be assembled to recreate the initial molecular structure. 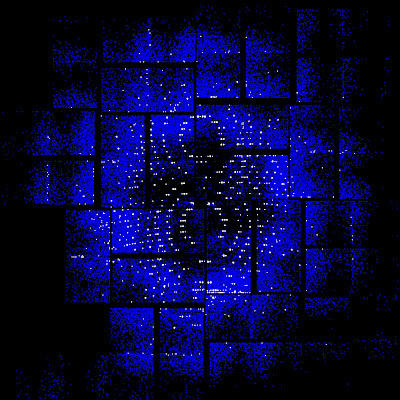 In this case, the team collected some 4 million snapshots, 293,195 of which included a diffraction pattern. They combined 61% of those (178,875) to produce a final 3D structure at near atomic resolution. 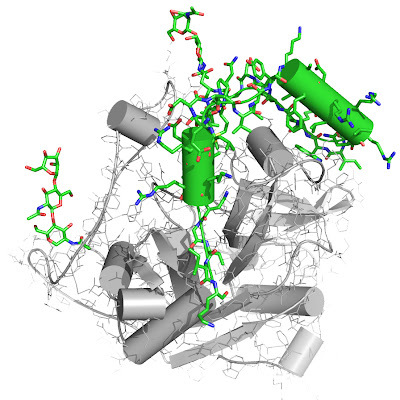 By comparing that structure with the human cathepsin B, the authors identified differences that might be exploited for drug development purposes. But on a larger note, this paper represents an important step in protein structure determination. As x-ray sources get brighter and brighter and are focused to smaller and smaller points (this study used a beam 4 micrometers in diameter), it may become possible to solve the structures of individual protein molecules, without crystallization. That could potentially open the technique to all those researchers who have not been able to solve their protein structures because of either financial difficulties, low protein abundance, or poor crystallization. In effect, it could democratize so-called "structural genomics."